Figure 1. Map of Bike Route 2. North Carolina Bike Route 2, the “Mountains to Sea Route,” runs the width of the state and is routed on-road on US 23/74 for the section in Jackson County. Bicyclists using this route faced difficult road conditions consisting of a narrow shoulder and rumble strips that discouraged use, and some riders chose to exercise their legal right to ride and control the outermost travel lane. This five-mile section is a four-lane divided highway with a speed limit of 55 MPH and annual average daily traffic volumes in the low 20,000s. North Carolina Bike Route 2 is a popular route for organized bike rides, including the annual fall Mountains to Coast ride. 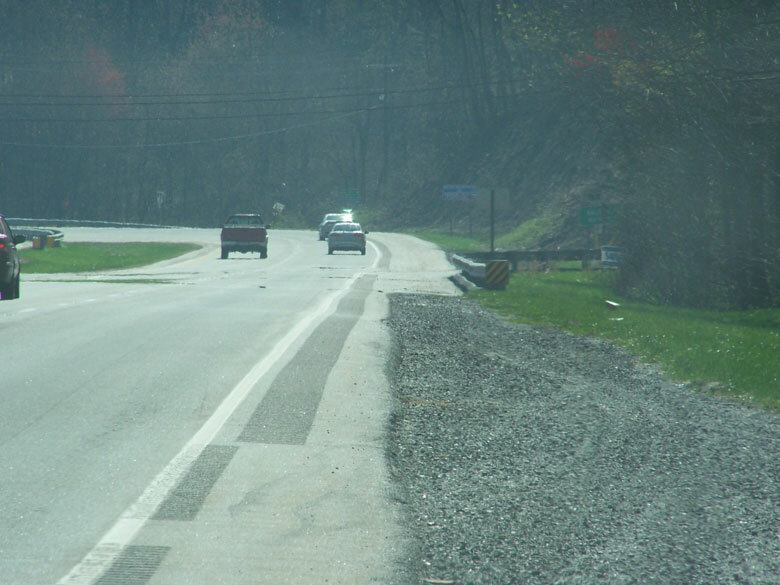 In 2007, rumble strips were added for safety reasons, in a modified location on the outside travel lane in an attempt to accommodate both bicycle and motor vehicle traffic. Yet neither motorists nor bicyclists saw this as an adequate solution. The combination of narrow shoulders and rumble strips reduced the functionality of the shoulders for bicyclists and preemptively disrupted motorists. In 2012 the road was scheduled for repaving. 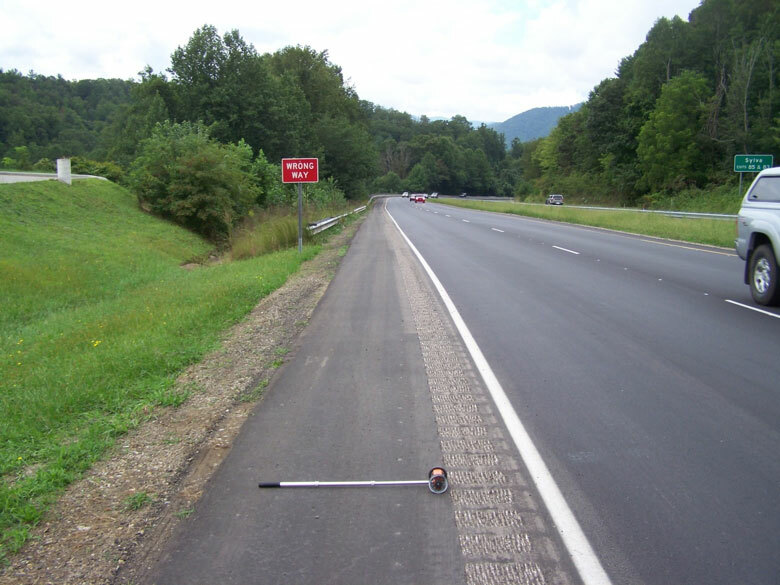 After NCDOT decided the rumble strips crucial for safety, and hearing feedback from bicyclists, they decided to widen the shoulders on about five miles of US 23/74. The existing four-foot shoulders were widened to 6 feet, offering better accommodations for bicyclists using the roadway while continuing the use of rumble strips for motorist safety. Figure 2. Map of resurfacing and shoulder widening route with the Town of Sylva in the lower left of the map. The total cost for the wide shoulders was $524,630.54 with funds coming from the Transportation Improvement Program (TIP). To increase the usable shoulder width, 12 inch rumble strips were used, instead of the 18 inch norm. Intermittent gaps in the rumble strips allowed for bicyclists to enter or exit safely and smoothly, a 25-foot section with no rumble strips was established near intersections or driveways, and the strips were eliminated in shoulder portions with less than four feet of clear shoulder space. Since the resurfacing and widening, bicyclists have commented positively about the wider shoulders. North Carolina Bike Route 2, the “Mountains to Sea Trail,” runs the width of the state and is routed on-road on US 23/74 for the section in Jackson County. Bicyclists using North Carolina Bike Route 2 on US 23/74 faced difficult conditions of a narrow shoulder and rumble strips that discouraged some from using and enjoying the route. Rather than face the conditions on the shoulder, some riders chose to exercise their legal right to ride and control the outermost travel lane. Figure 3. Road prior to resurfacing with rumble strips on white shoulder line.Credit: Reuben Moore. NCDOT widened shoulders on about five miles of US 23/74 as part of a 2012 resurfacing project. The existing four-foot shoulders were widened to 6 feet, providing better accommodations for bicyclists using this high speed four-lane road that contains rumble strips. The project limits are the interchange with US 23/74 and Business 23 to the west and the US 23/74 and Dark Ridge Road intersection to the east. This five-mile section is a four-lane divided highway with a speed limit of 55 MPH. Annual average daily traffic volumes are in the low 20,000s. To the west of this section, not part of Bike Route 2, US 23-74 is a limited access highway and operates similarly to an interstate. In 2007, rumble strips were added to this five mile stretch of highway for safety reasons. To try to accommodate bicycle and motor vehicle traffic, some areas had rumble strips installed on the outside lane striping, instead of six inches outside of the striping. The hope was that this would still allow bicyclists to use the shoulder. However, motorists would complain when they encountered the rumble strips before completely leaving the travel lane and bicyclists were reporting that the narrowed shoulders were not usable and instead chose to control the outside lane. Figure 4. Before picture showing the different types of rumble strips bicyclists faced in navigating the shoulders. North Carolina Bike Route 2 is a popular route for organized bike rides, including the annual fall Mountains to the Coast ride. The combination of narrow shoulders and rumble strips reduced the functionality of the shoulders for bicyclists. The project’s multi-modal goal was to better incorporate bicyclists as active users of the roadway. 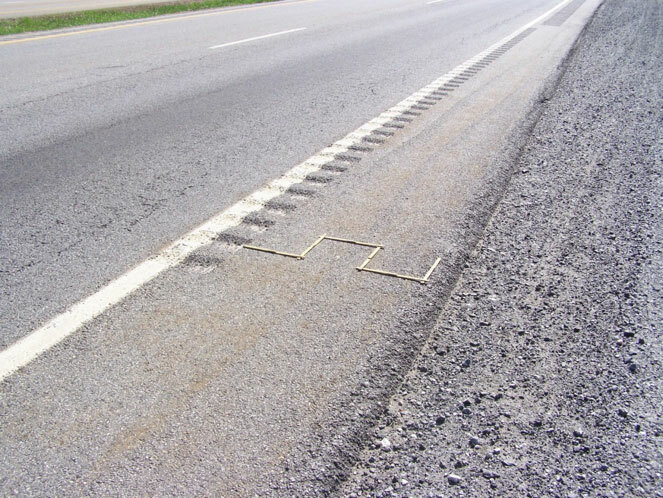 Initially there was discussion of not putting rumble strips back in with the resurfacing, but the road geometry increased the potential for motorists running off the road; thus the safety benefit was significant. NCDOT, after deciding that the rumble strips were necessary and along with encouragement and feedback from bicyclists, moved forward with widening the shoulders as the resurfacing project progressed. The road surfacing project was part of a $7.2 million project contract awarded by NCDOT. The total cost for the wide shoulders was $524,630.54 with funds coming from the Transportation Improvement Program (TIP). Figure 5. After road surfacing and widening demonstrating a gap in the rumble strips to allow bicyclists to maneuver. The road surfacing project began in May 2012 and concluded on October 5, with the installation of the rumble strips subsequent to the construction of two additional feet of shoulder. To increase the usable shoulder width, 12 inch rumble strips were used, instead of the 18 inch norm. The rumble strips were installed in an 80’-12’ pattern: Approximately every 80 feet of rumble strips, 12 foot gaps allow bicyclists to cross, merge, or turn from the shoulder. A 25-foot section with no rumble strips was established near intersections or driveways. 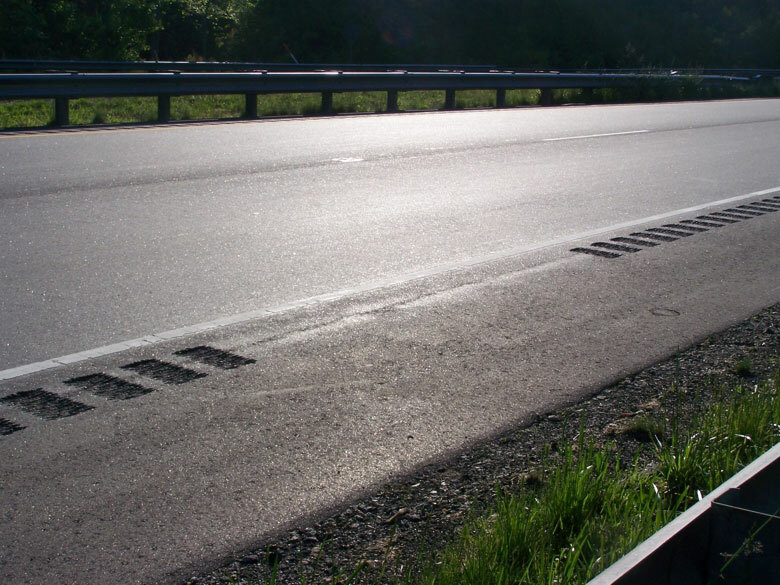 Rumble strips were also eliminated in shoulder portions with less than four feet of clear shoulder space, such as next to guardrails or other obstacles. There are about three such areas along the 5 mile span. Since the resurfacing and widening, bicyclists have commented positively about the wider shoulders. This project is one of two sections to get similar treatments. Just east of this section of highway, US 23/74 was resurfaced without width added to the shoulder, due to a lapse in adequate funding for the shoulders. When NCDOT engineers discovered this, they moved to secure funding for the widening. They decided to not lay down rumble strips until the widening was completed, likely in spring of 2014. 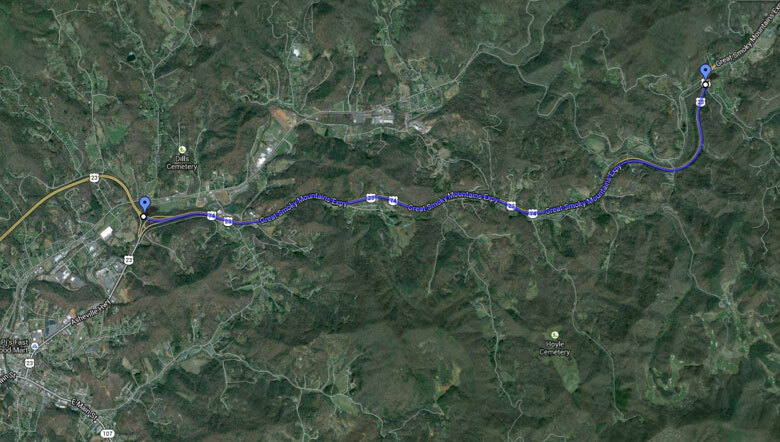 Once completed, the road will connect with a section further east in Haywood County that has wide shoulders and is also bike friendly. The completion of all these roads with wide shoulders will better enable bicyclists and motorists to use the road in order to safely and enjoyably reach their final destinations. Figure 6. After condition demonstrating the minimum 4 foot width for bicyclists in shoulder. Mitchell, J. (2013, November 4). Discussion of US 23/74 Resurfacing. Moore, R. (2013, November 1). Discussion of US 23/74 Resurfacing. Rogers, K. (2013, November 6). Discussion of US 23/74 Resurfacing.